Kaylin's Kit: Review: Pristine Beauty Suga Suga Woo! Woo! 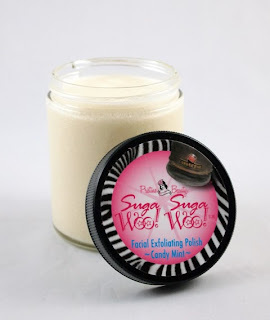 Review: Pristine Beauty Suga Suga Woo! Woo! I've been a big fan of Pristine Beauty's products in the past, so I was thrilled when the company reached out to me to test their newest product, Suga Suga Woo! Woo! Facial Exfoliating Polish. Director Blaire creates some of the most delicious products on the market, and Suga Suga Woo! Woo! is no exception. It smells just like one of my all-time favorite ice cream flavors: chocolate mint. Suga Suga Woo! Woo! is an exfoliator with plenty of sugar to help leave skin smooth, plus a healthy dose of moisturizing ingredients to leave your skin hydrated. Unlike other exfoliators, it has a cooling effect from the mint, which is soothing after the roughness of the sugar. I love how it is vegan and has no "mystery" ingredients. I put this in EWG's Skin Deep database and it came out a 0 - the lowest hazard rating. However, it couldn't find the ingredient Maqui Berry, but a little internet research suggests that it is a full of antioxidants and quite safe. As always, Pristine has created another fun, vintage-style package that makes me smile every time I see it. At $30, this isn't the cheapest exfoliator, but a little goes a long way on your face - so it will last for quite some time. Plus, with ingredients like coconut oil and organic mint extract, it's hard to beat the quality. If you have dry to normal skin, you could consider using it daily, but I found that for my normal to oily skin, twice a week worked better. The hydrating oils are great, but this exfoliator may be a little too hydrating for daily use on oily skin. Overall, it's a great product. I am tempted to use it on my body as well so I can smell like chocolate mint all day! Yum!